Use items, folders and learning modules to present to students the content that is most relevant to them at that point in time, whether that is a specific learning activity or relating to a specific week in the taught module. Presenting too much information reduces the impact of clear instructions and can leave students unsure of what they should be focusing on. Items and folders structure your content to avoid this problem. Folders are ways to group items and links to Yorkshare tools together. If your weekly timetable often has more than one session or learning activity, structure your site with folders, for example one per week, to make your site look neater and make it easier for students to navigate. Learning modules offer an alternative way to present sequential content. They are similar to folders, but show items or links to tools one at a time to students. They are used more commonly in distance learning where the structure of the site and order of delivery of content is more important than quick access to specific downloadable files. In general, you won’t need to use learning modules to support lecture-based courses. When using learning modules, the content needs to be broken down into units of learning, typically one per topic. Each unit will have a series of learning objects (items) that address a particular part of the topic. Yorkshare tools, for example quizzes, may be embedded into learning modules so that students have to complete a task before they have access to the next module using adaptive release. Students navigate learning modules using next and previous buttons at the top right, or the table of contents to the left. Poor site structure and labelling is a significant barrier to students who use screen-reading software and other assistive technologies to access Yorkshare. Aim for consistent structures that do not require too many clicks, but also do not present pages with too much content on at once. Enable students to get to the learning materials quicker, reducing the need for guess-work as to what to click next and reducing confusion over what should be downloaded. Poor navigation can lead to students not undertaking preparatory tasks, not finding reading or missing key information on assignments. If sites have complex structures, include an explanation on the opening page of the site and show students the site in your first face-to-face session. Grouping resources and instructions together within one item reinforces the link between the resource and learning activity. This also reduces the number of headings and items on the page, which makes the site appear tidier. 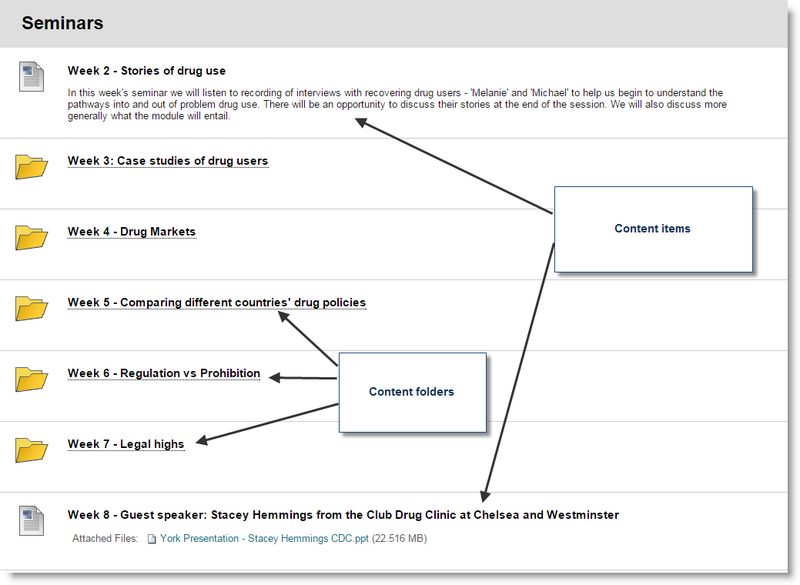 Group content using items and folders based on the structure of the module, for example by topic, week or activity. The headings of the items and folders then present a clear path for the student to progress through the site. As the screenshot from the Seminars content area shows above, students work their way through the items/folders which are set up one per week. 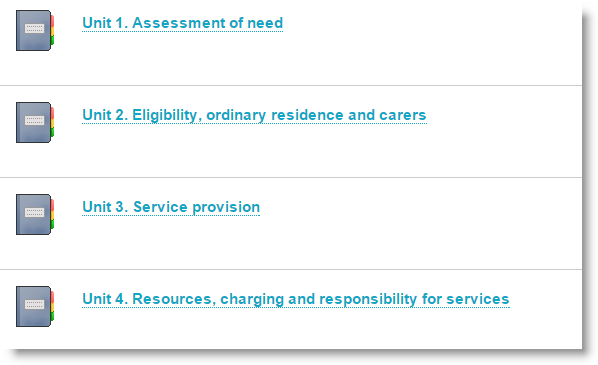 Where additional resources are to be provided, these are added within a folder for that week.